Word Games - Enjoy & sharpen your vocabulary, puzzle, and spelling skills playing anytime and anywhere. An entertaining quiz, an addictive game, and a new way to test and improve your vocabulary! Designed with sophisticated algorithms the app builds your vocabulary with mini-tests where players match words with multiple-choice. Word Games is an app that helps you learn new words, word grammar, improves long-term memory via short quizzes and games. Download the app and answer a series of short vocab questions to reveal a whole new world of words. There are three different word games. 1. WORD MEMORY:: Word Memory game is one of our working memory exercises that tests for verbal span. This type of memory is what allows us to remember what we hear or read long enough to use the information, either right then and there or by transferring it to long-term memory. Read each of the 15 words within 30 seconds, and try to remember them without taking notes. After time elapses, recall and type in as many words your remember. By short-term memory, a person can remember different things for a period of seconds or minutes only. By rehearsal, the duration and the quantity of storage will increase. Therefore, rehearsal transforms the short-term memory into the long-term memory. 2. 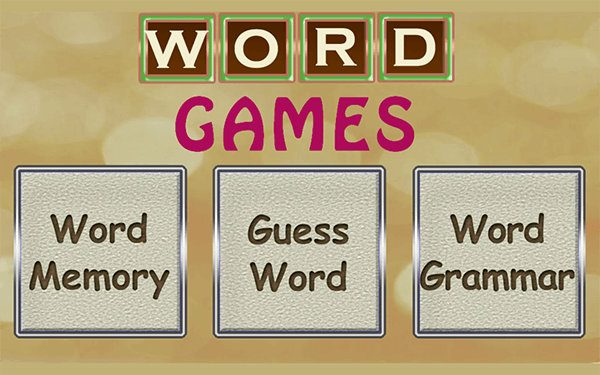 GUESS WORD:: Word Guess is a word game in which the player guesses the word from its meaning that actually lets you search for words by description. Guess word to add to your score. This game is fun and will also improve your vocabulary. 3. 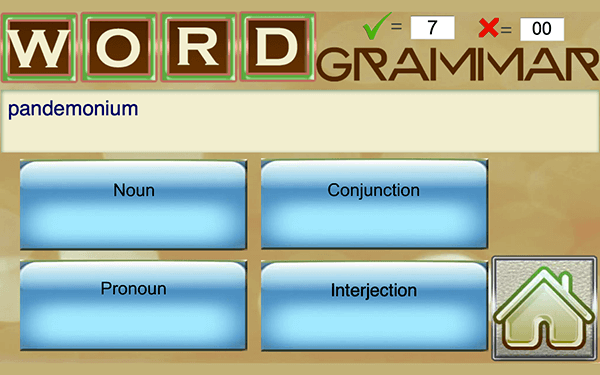 WORD GRAMMAR:: Word Grammar is a fun educational game to practice the eight parts of speech in the English language. This app is great for building vocabulary and enhancing reading comprehension. It includes noun, pronoun, verb, adjective, adverb, preposition, conjunction, and interjection that can help you to improve your understanding of the different parts of speech to provide learners with an opportunity to improve strategies for grammar success. Word Games is a perfect fit for fans of word games. With over thousands of quizzes to play, Word Games is the best word game for people looking for brain challenging stimulating word finder games. Word Games is a very fun and exciting word game, it makes you keep playing for hours. Get ready to exercise your word brain, expand your Vocabulary and Improve your Concentration Skills. • Tons of words that can be useful for preparing competitive exams. • Unlimited quizzes using thousands of words. • Simple and addictive word game. • Three great games. Word Memory, Word Guess, Word Grammar. Feature Word Games is an entertaining quiz, an addictive game, and a new way to test and improve your vocabulary!